Your support of the Connecticut Horticultural Society (CHS) helps us maintain our mission and vision as an educational organization dedicated to encouraging and improving the practice of gardening and the dissemination of horticultural information to its members and the public. Your support also enables us to be the leading supplier of horticultural scholarships to University of Connecticut (UConn) and Naugatuck Valley Community College (NVCC) students, in related studies, who are Connecticut’s horticultural future. 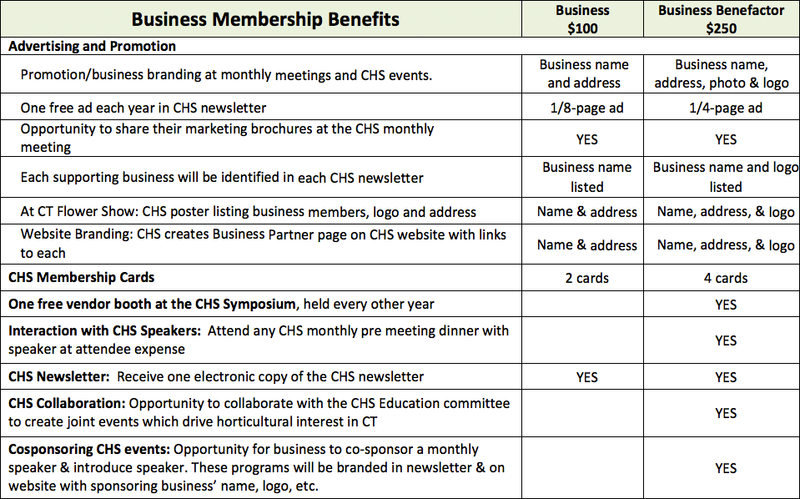 We offer two levels of annual CHS Business membership: Business Member ($100) and Business Benefactor ($250); with the benefits of each level listed below. We’re sure you’ll find that the benefits your organization receives will outweigh the actual membership cost. To pay your membership dues online, please click here. If you’d prefer to register through the mail, click here to download our Business Membership Form.